Axel NUT 9.5MMX24TPI1 |Bike Bros. | House of sweet nuts - Bike Bros. 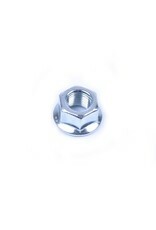 These high quality front wheel nuts have 6 sides for high performance box or open ended wrenches to work on. Meeting the highest quality and performance standards and with proven aerodynamics, these are some of the fastest nuts on the market. Compatible with single speed and geared bikes. Not compatible with quick release hubs or thru-axle forks.